Effie Kammenou is a believer that it is never too late to chase your dreams, follow your heart or change your career. She is proof of that. At one time, long ago, she'd thought that, by her age, she would have had an Oscar in her hand after a successful career as an actress. Instead, she's worked in the optical field for 40 years and has been the proud mother of two accomplished young women. 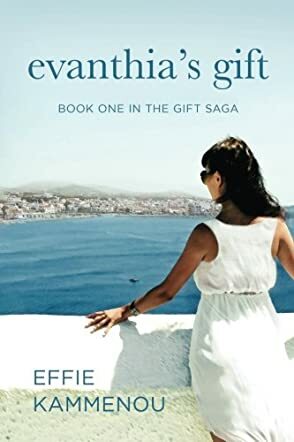 Effie Kammenou writes with confidence in her debut novel Evanthia's Gift: The Gift Saga Book 1, where we follow the story of a Greek-American family through the life of Anastacia Fotopoulos. In a story spanning three generations, we get a glimpse of life in Greece through her parents’ and in-laws' viewpoints as the country is ravaged by the Second World War. In 1956, Ana finds herself in New York, pregnant, and escaping from a bad marriage. Surrounded by family and friends, she tries to get on with her life, vowing not to fall in love again. That is until a former acquaintance, Alexandros Giannakos, comes along. Unable to get pregnant again, Ana goes through another painful phase. And her daughter, Sofia, who grows up between two cultures, faces her own struggles too. Evanthia's Gift: The Gift Saga Book 1 chronicles the life of a Greek-American family. As such, we get to learn about the Greek culture and how it is preserved in a foreign country through generations. The recipes at the start of some chapters certainly help to enhance the story. And if it’s location you want, Evanthia’s Gift offers that too, but Effie Kammenou, unwittingly perhaps, shows us that even in New York, a place of many nations, Ana still prefers her own kind when it comes to those she keeps the closest. As the story progresses, the plot reveals a number of fissures crackling beneath the surface - marriages falter and children stray. In the end, this is a universal story of love, pain, hope, and dreams made exceedingly colorful and interesting because it unravels through generations and between two completely different cultures.